Anemia is a common side effect of chemotherapy. Limited information exists about its incidence and risk factors. The objective of this study was to evaluate the incidence of anemia and risk factors for anemia occurrence in patients with early breast cancer who received adjuvant chemotherapy. We evaluated risk factors for anemia in pre- and post/perimenopausal patients with lymph node-positive early breast cancer treated with adjuvant chemotherapy in two randomized trials. All patients received four cycles of doxorubicin and cyclophosphamide (AC) followed by three cycles of cyclophosphamide, methotrexate, fluorouracil (CMF). Anemia incidence was related to baseline risk factors. Multivariable analysis used logistic and Cox regression. Among the 2,215 available patients, anemia was recorded in 11% during adjuvant chemotherapy. Grade 2 and 3 anemia occurred in 4 and 1% of patients, respectively. Pretreatment hemoglobin and white blood cells (WBC) were significant predictors of anemia. Adjusted odds ratios (logistic regression) comparing highest versus lowest quartiles were 0.18 (P < 0.0001) for hemoglobin and 0.52 (P = 0.0045) for WBC. Age, surgery type, platelets, body mass index, and length of time from surgery to chemotherapy were not significant predictors. Cox regression results looking at time to anemia were similar. Moderate or severe anemia is rare among patients treated with AC followed by CMF. Low baseline hemoglobin and WBC are associated with a higher risk of anemia. 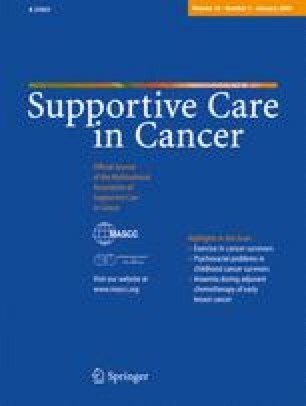 The authors represent the International Breast Cancer Study Group. We thank the patients, physicians, nurses, data managers, and trial coordinators who participate in the International Breast Cancer Study Group trials and Joie Celano for central data management. Supported in part by the Swiss Group for Clinical Cancer Research, Frontier Science and Technology Research Foundation, The Cancer Council Australia, Australian New Zealand Breast Cancer Trials Group, National Health and Medical Research Council of Australia (grants 940892, 980380, 100925), United States National Cancer Institute (CA-75362), Swedish Cancer Society, Foundation for Clinical Research of Eastern Switzerland, Cancer Association of South Africa (for South African patients), Orion-Farmos (for medication for trial 14–93).